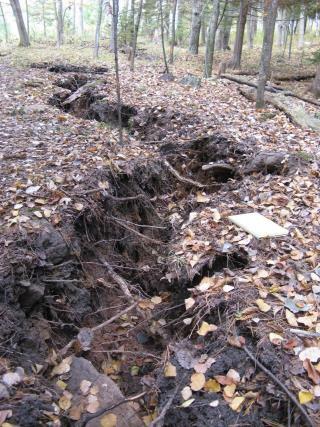 (Newser) – In 2010, Michigan's Upper Peninsula recorded its first-ever earthquake when a large crack opened in the ground near the city of Menominee, according to a press release from Michigan Technological University. Now researchers finally know what caused the mysterious Menominee Crack. Sort of. Live Science reports the crack—360 feet long and 5 feet deep—showed up accompanied by a "deep boom" and the rattling of nearby homes. The earthquake that occurred along with it it measured less than a magnitude 1. For years, no one was sure what to make of the crack, which appeared atop a large limestone ridge. That area of Michigan is considered "aseismic," and there is no earthquake fault under the crack. Besides, any earthquake large enough to cause the crack would have done more than shake a few homes. Typical of science. Don't know what the hell it is? Just give it a new name, and pontificate. After millenia of slumber, He awakens! He will lead us all to glory once again!